Salem: Cherie Mann, a nursing student at Salem State University, sorts through a large collection of nursing textbooks at the university bookstore. This fall, the bookstore is offering textbooks for rent as well as for purchase. Photo by Mary Catherine Adams/Salem News. , Salem: Cherie Mann, a nursing student at Salem State University, sorts through a large collection of nursing textbooks at the university bookstore. 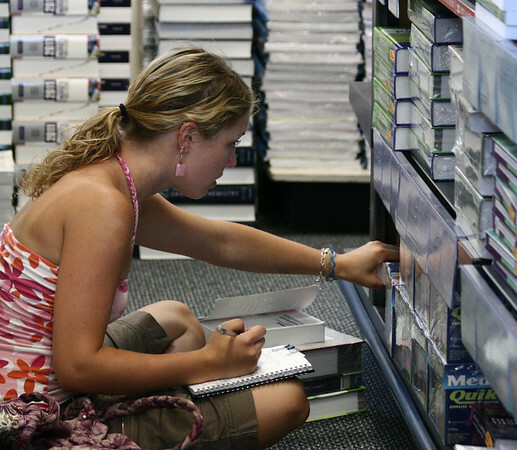 This fall, the bookstore is offering textbooks for rent as well as for purchase. Photo by Mary Catherine Adams/Salem News.